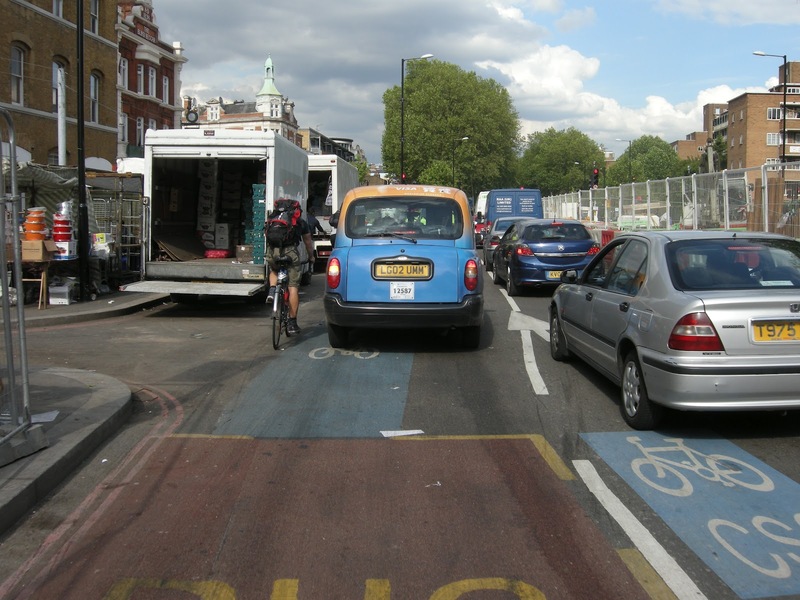 Cyclists in the City: A post in praise of Transport for London but in criticism of more stupid cycling comments by Boris Johnson. Now, there's a rare thing. A post in praise of Transport for London but in criticism of more stupid cycling comments by Boris Johnson. Now, there's a rare thing. Last week Transport for London issued a press release that is probably the most refreshing official announcement I've seen about cycling in London. The release, written by a senior official in TfL's 'surface transport' team provides some details about the scale and timetable of the Mayor's junction safety review programme and about the future of the much-maligned cycle super highways. It is backed up by an internal report that I have seen and that provides more detail than has been released publicly. I have fewer good things to say about yet more blatantly populist, irresponsible comments by the Mayor Boris Johnson on Sky News yesterday. Talking about his cycle super highways, he told Sky; "They're for indicative purposes"only. He wanted to make the point that people can drive in them if they want to. If that's the case, why even bother spending £100million (the numbers keep changing) on them in the first place? But back to TfL: Not everything about this press release is perfect. There is, for example, a supernatural belief that mirrors on top of traffic lights will save people's lives - something that the Dutch road safety institute studied for several years and concluded won't work: "Truck drivers do not make the best possible use of the different mirrors [and] cyclists insufficiently take account of the fact that trucks have a limited visual field." So true. That aside, this press release contains some pretty major news. The news sounds, at first glance, like bad news. TfL has announced that next year it will build a new cycle super highway from Lewisham to Victoria. It also announced that it will extend the super highway from the City to Bow so that it continues through Stratford. The bad news is that three other cycle super highways that were originally planned for 2013 are nowhere to be seen - routes from Hounslow, Muswell Hill and West Hampstead are all off the list. On the surface, then, less investment in cycle super highways? Super Highway. As good as useless. In fact, worse than useless. But TfL's use of language is interesting: "These new superhighways will reflect and incorporate lessons learned from the junction review." The press release talks of 'lessons learned'. I can only hope it means that TfL has learned that the new cycle highways must be better than the current crop that expose people to highly dangerous manoeuvres, to squeezing alongside lorries at junctions and having to dodge parked cars, parked legally smack bang across the cycle highway. 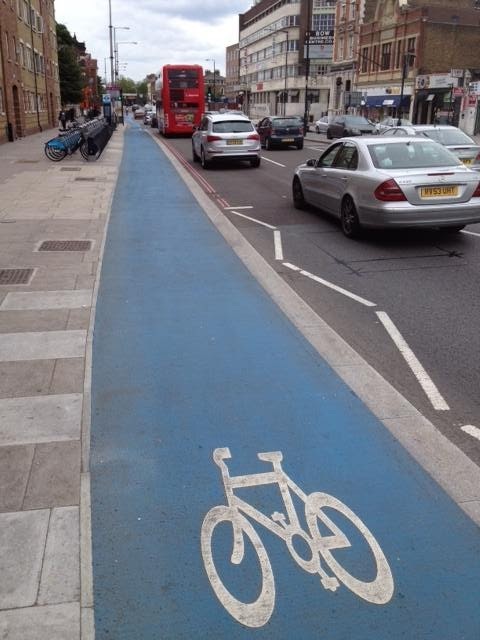 Provided they do it well, I'd far rather see one and half really decent cycle highways built in London next year than four utterly mediocre ones, that are just as dreadful as the majority of the existing Super Highways. Provided, of course, that's the plan. And we're not sure yet if that's the case or not. That said, I've seen draft plans for some of the 35 junctions TfL plans to implement next year. And I can support TfL's claim that: "Improvements at these locations will include widening junctions to allow more space for cyclists, creating more segregated cycle lanes and installing innovative 'early-start' traffic signals to allow cyclists to move through the junction ahead of other traffic." I haven't, however, seen the final plans and not all of the schemes are perfect. But the notable point is that Transport for London is, for the first time, admitting it needs to create dedicated space for people on bikes on London's main roads. And that it can achieve that by widening junctions. This is in direct contrast to most new schemes in the last five years which have seen the carriageways narrowed and made more dangerous for people on bikes. Clearly something is getting through. At last. You can see a map of the junctions under review on the London Cycling Campaign website, which also confirms something I've mentioned in this blog several times - that TfL intends to review the road layout at the northern end of Blackfriars Bridge. This is an issue dear to my heart as I negotiate the right hand turn into Queen Victoria Street most mornings, flinging myself across three lanes of traffic. Easy on a road bike. Completely miserable on a Boris bike. By the looks of things, junctions to get the review treatment include: Stockwell; Kennington Cross; several junctions along the existing Cycle Super Highways. As the London Cycling Campaign put it to The Times last week: "the devil might be in the detail" but at least things seem to be moving. 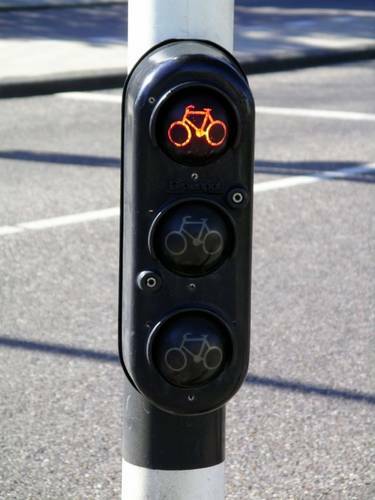 The press release also confirms something else I've mentioned before: TfL intends to test proper Dutch-style bike traffic lights. Low level bike lights with a red signal featuring a bicycle logo. And TfL also announces it intends to promote cycle design standards across London (bear in mind most of London's roads are operated by the boroughs not by TfL) and - shock, horror - will integrate 'design concepts from European highway authorities'. This is a massive change in tone from Transport for London. For the first time, I get the sense that the organisation is trying to make cycling work in London. I'm certain there will be some big disappointments still to come but you can't deny this sort of language and this sort of commitment to meaningful infrastructure for cycling is very different to the aggressive and somewhat insulting tone that Transport for London was using a year or so ago. I sense that Boris Johnson may be steering these changes behind the scenes. I've been fiercely critical of Boris Johnson's failure to get cycling right in his first term of office. Now that he's in his second term, the proof really will be in the pudding. But at least TfL seems to be thinking about the right ingredients. At last. It's good to hear your inside track on these things, as it suggests there is some real substance behind the change of tone. But then this morning TfL started consulting on a new Road Safety Action Plan (link below), and it looks like the bad old version of TfL again. While the previous road safety plan had specific casualty reduction targets for individual categories of road users including cyclists, this new plan proposes only a single overall target of 40% reduction in serious/fatal casualties by 2020. Obviously, this could be achieved even if the number of cyclist casualties increase (as it has in recent years). The document talks (p32) about wanting to see no increase in cycling casualties but with no target to measure this against there is much less imperative to make it happen. What's more, the target is to reduce 'KSI' by 40% by 2020 from a baseline of 2005-09, but we have already seen a reduction of 23% from that baseline as of 2011, so what they are proposing is just another 23% reduction from 2011's figure, but this time over 8 years. So they are actually proposing as a target a *slower* rate of casualty reduction than we have seen in recent years (see Fig 13 for a graphic illustration). Lastly, there is very little sign in the document as a whole of a radically new approach to road design or road safety in general. Action after action consists of 'Continue to ...', and I can find very little that is both new and potentially significant. I really hoped for something much better but I'm afraid this isn't it, and I hope you can help organise a really powerful call for something much better from cycling campaigners in London. WHEN road engineers in a variety of countries are unable to put in place the signs giving the " miles to ---" in the correct order , what chance is there that they can design " Cycle Paths "? 25 miles becomes a little later 27 miles , becomes 26 miles becomes 24 miles , becomes 25 miles and so forth ! Of course on the motorways there are even more amusing situations ! Driving on the autobahn from Saarbrucken towards Karlsruhr , you used to see the signs giving 150+km and then it would jump to 320+km for some obscure reason . Road engineers need to get on a bike in rush hour , better still be required by their masters to do this before they collect their salary each month . Wonder how long it would take for their perspective to change ? TfL continuing to spend money on 'cycling safety' means nothing if it consists of silly mirrors and paint. Danny, on the issue of cycle only signals, I have been told by a friend at the DfT that they are a couple of years away due to regulations being redrawn now. Hope your time scale is right, but I am not holding my breath! Any company’s success story is largely dependent upon the way its logistics department has played the role. For seasonal or medium to small scale enterprise it is not feasible to set up their separate logistic department as it can be an extra cost to the company.